Niue is a small island nation located in the South Pacific Ocean. Known as "Rock of Polynesia," it is the largest coral island in the world. Although it is self-governing, Niue exists in free association with New Zealand, meaning that the Queen of New Zealand Elizabeth II of Great Britain is the sovereign-in-right of New Zealand and the head of state of Niue, and most diplomatic relations are conducted by New Zealand on Niue's behalf. Niue is located about 1,500 miles (2,400 km) northeast of New Zealand in a triangle between Tonga, Samoa, and the Cook Islands. The island is 100 square miles (260 square kilometers), about 1.5 times the size of Washington, DC. There are three outlying coral reefs that do not have any land area: Beveridge Reef, located 185 miles (300 km) southeast, is a submerged atoll, drying during low tide, six miles (9.5 km) from north to south and nearly five miles (7.5 km) east to west. It has no land area, and has a lagoon 36 feet (11 m) deep. Antiope Reef, located 120 miles (193 km) southeast, is a circular plateau approximately 1,300 feet (400 m) in diameter. Haran Reef is located at 21°33'S, 168°55'W. Niue's terrain is marked by steep limestone cliffs along the coast with a central plateau rising to about 200 feet (60 m) above sea level. A coral reef surrounds the island, with the only major break in the reef being on the central western coast, close to the capital, Alofi. A number of limestone caves can be found close to the coast. The island is roughly oval in shape and has a diameter of about 11 miles (18 km), with two large bays along the western coast (Alofi Bay in the center, and Avatele Bay in the south). Most of the island's population resides close to the west coast, around the capital and in the northwest. The island has a tropical climate with an average temperature of 81°F (27°C), modified by southeast trade winds. Annual rainfall averages about 300 inches (7,700 mm), with most rainfall occurring between November and April. Natural resources include fish and arable land. Forests and woodland make up 19 percent of Niue, arable land 19 percent, permanent crops eight percent, permanent pastures four percent, and "other" makes up 50 percent. 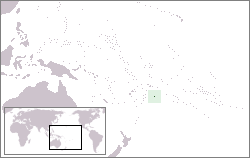 Niue was first settled by Polynesian sailors from Tonga, Samoa, and the Cook Islands. Captain James Cook was the first European to sight the island, but he was unable to land there due to fierce opposition by the local population. In response, he named Niue the Savage Island. Christian missionaries from the London Missionary Society converted most of the population around 1846. In 1887, King Fataaiki wrote to Queen Queen Victoria of England, requesting that Niue be placed under British protection, but his request was turned down. In 1900, in response to renewed requests, the island became a British protectorate, and the following year it was annexed by New Zealand. The British granted Niue to New Zealand in 1901 for services during the South African War. Niue gained its autonomy in 1974 in free association with New Zealand, which handles the island's military and foreign affairs. Niue had been offered autonomy in 1965 (along with the Cook Islands, which accepted), but had asked for its autonomy to be deferred another decade. In January of 2004, Niue was struck by a devastating cyclone (Cyclone Heta), which killed two people and left 200 of the island’s 1,600 inhabitants homeless. A number of local residents chose afterward not to rebuild. Niue's remoteness and the cultural and linguistic differences between its Polynesian inhabitants and those of the rest of the Cook Islands have caused it to be separately administered. The constitution specifies that in everyday practice, executive authority is exercised by the Cabinet of the Premier of Niue and three other ministers. The premier and ministers must be members of the Niue Assembly, the nation's legislative assembly. The assembly consists of 20 democratically elected members, 14 by the electors of village constituencies. The remaining six are elected the same way, except several constituencies are combined for each seat. Electors must be New Zealand citizens, resident for at least three months, and candidates must have been electors, resident for 12 months. The speaker is elected from among the members. Niue has been self-governing in free association with New Zealand since 1974. Niue is fully responsible for internal affairs while New Zealand retains responsibility for foreign affairs and defense. However, these responsibilities confer no rights of control and are only exercised at the request of the government of Niue; Niue has no regular indigenous military forces. Niue's economy is very small with a GDP of around U.S. $7.6 million (estimated in 2000). Most economic activity centers around government and work on family plantations. It uses the New Zealand dollar and relies on aid from New Zealand to sustain its government. The economy of Niue suffers from the Pacific Island problems of geographic isolation, few resources, and a small population. Government expenditures regularly exceed revenues, and the shortfall is made up by grants from New Zealand to pay wages to public employees. Niue has cut government expenditures by reducing public services by almost half. The agricultural sector consists mainly of subsistence gardening, although some cash crops are grown for export. Industry consists primarily of small factories processing passion fruit, lime oil, honey, and coconut cream. Per capita GDP was just U.S. $3,600 in 2000. Export commodities include canned coconut cream, copra (dried coconut meat), honey, vanilla, passion fruit products, pawpaws, root crops, limes, footballs, stamps, and handicrafts. Exports totaled U.S. $137,200 in 1999. Export partners in 2004 were primarily New Zealand, but also Fiji, Cook Islands, and Australia. Import commodities included food, live animals, manufactured goods, machinery, fuels, lubricants, chemicals, and drugs. Imports totaled U.S. $2.38 million in 1999. Import partners were again primarily New Zealand along with Fiji, Japan, Samoa, Australia, and the United States. In August 2005, Australian mining company Yamarna Goldfields suggested that Niue might have the world's largest deposit of uranium. It has permission to drill on the island to confirm geological data. For now though, foreign aid, mainly from New Zealand, is the island's principal source of income. Tourism generates some revenue. There is little industry on the island. Remittances from Niuean expatriates, generally from New Zealand, constitute a significant proportion of Niue's income as well. The government does generate some limited income from the sale of its postage stamps to foreign collectors and sale of its domain names, with its top level domain .nu. The government briefly flirted with the creation of "offshore banking," but under pressure from New Zealand, agreed to end its support for schemes designed to minimize tax in countries like New Zealand. The people of Niue are called Niuean. The ethnic makeup is mainly Polynesian, with some 200 Europeans, Samoans, and Tongans. The population of the island continues to drop (from a peak of 5,200 in 1966 to 2,100 in 2000) with substantial emigration to New Zealand. The current population is 2,166 (2006). The birth rate was 18.46 births per 1,000 population and the death rate 7.80 deaths per 1,000. Niuean is a Polynesian language closely related to the Tongan-Samoan languages. Beginning in 1846, missionaries formalized the alphabet, translating the Bible (Ko e Tohi Tapu) and a hymn book (Ko e Tau Lologo Tapu). Unlike other Pacific peoples, Niueans did not give Niuean names to new objects based on the sound of English words. Instead, they invented names in terms that were meaningful to them. For example "vakalele" (flying canoe) is used for airplane, "mama pala" (damp lungs) for tuberculosis, and "mata-afi" (fire fragment) for matches. English has increasingly become the language spoken by Niueans. Fears that the Niuean language might disappear led to the establishment of the Niue Foundation, and publication in the twentieth century of a revised Niuean dictionary and hymn book. Seventy-five percent of Niueans belong to the Ekalesia Niue, or Niuean Church, which is a Protestant church closely related to the London Missionary Society. Ten percent belong to the Church of Jesus Christ of Latter-day Saints, and the other 15 percent are Roman Catholic, Jehovah's Witnesses, and Seventh-day Adventist. More Niueans live in New Zealand than in Niue. New Zealand’s 2001 census showed there were 5,328 New Zealand residents born in Niue, while 20,148 included Niuean ancestry in their ethnicity. Niueans increasingly looked to New Zealand as a land of opportunity, and Niue’s main export has become its people. Around 1936, when the census recorded 54 Niue-born residents in New Zealand, family members began establishing themselves in New Zealand so that others could follow. By 1943 the population was 200. These Niuean immigrants settled in Auckland and met in hotels to speak their native language and sample the "vai mamali" ("smiling water"). When cyclones battered Niue in 1959 and 1960, the new houses built with New Zealand aid introduced modern conveniences, which changed Niuean attitudes. Whole families flew to New Zealand and encouraged the others to follow. This exodus increased when Niue’s airport opened in 1971. Niue has one primary school on the island, one secondary school, and one early childhood education facility. Literacy rates are 95 percent for the total population. Although Niue has fewer than 500 rugby players, the nation competes keenly on the World Rugby Sevens Circuit. Many participants are based in New Zealand, and some play for their adopted country—the most-capped All Black center Frank Bunce is Niuean-Samoan. Despite being one of the world’s smallest rugby-playing nations, in 2003, Niue beat both Japan and the U.S. Other popular sports include kilikiti (Niuean cricket), netball (a sport based on basketball), and softball. In the arts, John Pule has established himself as both a writer and a printmaker—his novel The Shark That Ate the Sun (1992) describes the journeys, difficulties, and bonds of a migrant Niuean family. Popular hip hop artist Che Fu draws heavily on his Niuean–Māori heritage for inspiration. He has won several Tui Awards, a New Zealand music award. Manaia Studio is the only recording studio on the island. Church choirs are common. ↑ UN THE WORLD TODAY (PDF) and Repertory of Practice of United Nations Organs Supplement No. 8; page 10 Retrieved November 19, 2011. ↑ Niue. The World Factbook. Central Intelligence Agency. Retrieved November 19, 2011. This page was last modified on 6 December 2018, at 17:18.